I shudder to think who they're supposedly casting as Brian in this upcoming Kray Twins flick allegedly being made now ~ as claimed by some anonymous somebody. Nobody really puts a name on the producer or screenwriter, or anyone ~ which is a bit suspicious if you arsk me (you might well arsk). ~ the movie had their simplest basic Beatles facts wrong, too! Just one example: they had their "Brian" remarking that John was the only married Beatle ~ and this was a telephone conversation supposedly taking place in 1967! Then they had their Orton character "sending up" (i.e., mocking/making a fool out of) "Brian" to his f*ck buddies. Sooo classy and *cough* authentic. London, June 21 (ANI): The Kray Twins schemed to take over as The Beatles’ managers, it has emerged. It has also been revealed that Reginald ‘Reggie’ Kray and Ronald ‘Ronnie’ Kray, the foremost organised crime leaders dominating London’s East End during the 1950s and 1960s, asked Glasgow crimelord Arthur Thompson for advice on their plan. The astonishing tale of how John, Paul, George and Ringo were almost taken over by the twin brothers is set to hit the big screen. Two TV soap stars have been lined up to play the killers. And the flick’s scriptwriter has revealed how Reggie and Ronnie schemed to take over as the Fab Four’s managers. "The twins respected Arthur Thompson over his business dealings. And during their only visit to Glasgow they told him they were thinking of managing The Beatles," the News of the World quoted Colin Fry, 65, who knew the Krays for 25 years, as saying. The meeting between the three feared crime bosses took place in the early 1960s in the now-demolished Cockatoo Bar in Govanhill. At the end of their discussions, the Krays stunned the Glasgow Godfather by telling him they were taking over Beatles manager Brian Epstein’s music empire. It is believed they had been planning to blackmail the fabulously rich pop guru into handing over his business. "Ronnie and Reggie had been introduced to Epstein one evening at a gay club in London. At the time he was managing The Beatles, who were making colossal amounts of money,” Colin said. It was suspected they had evidence he was having a gay affair with a musician. He was keen to keep his sexuality secret. So he was told that the Krays were taking The Beatles off him," Colin added. However, the twins were talked out of their takeover plan by their Scottish colleague. *A* gay affair? ..... just ONE? Boy, for being the top crime mavens in the country, they sure were clueless! But they went ahead and blackmailed him anyway. 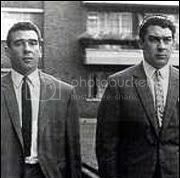 If you're unfamiliar with the Kray Brothers, check this out. this TRU TV bio / history of the Krays! ~ BTW, Van Donovan is truly the guy who got me started doing all my Eppy stuff online. If not for Van, you would probably never know me!